Enjoy the stunning peninsulas of the Southwest. There are plenty of stops along the Ring of Kerry for morning tea, lunch and photo stops etc. 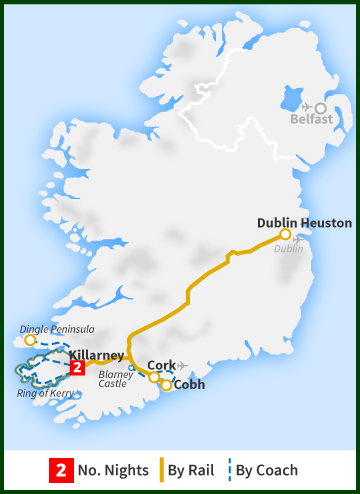 Ireland’s highest mountains are located in Kerry and Carrauntouhil, which can be seen en route. It is the highest, standing at 1041 met. We will make a stop at the Kerry Bog Village Museum, which gives people an insight into how people lived and worked in rural Ireland in the 18th century. The village is the only one of its kind in Europe. Later on the approach to Waterville there are views (weather permitting) of the Skellig Rocks (islands), where Star Wars 'The Force Awakens' was recently filmed. We will make several photo stops, a stop for lunch and one final stop at the pretty village of Sneem, for about 30 minutes, or as directed by your tour leader. Enjoy a Full Irish Breakfast at your leisure. The Dingle Peninsula has the most rugged Atlantic coastline in Kerry and is scattered with forts and pre-historic huts such as the Gallarus Oratory. Much of Irish heritage is maintained in this Irish-speaking region including traditional music and art forms. Considered by many to have some of Europe's most spectacular scenery, the peninsula also supports both a rare and unique assortment of flora and fauna. Slea Head is the most westerly point in Europe and standing there, looking towards America, instills a feeling of excitement and empathy with the millions of emigrants who took this route. There are splendid views around Slea Head, especially of the Blasket Islands and the scattered rocks. The Great Blasket Island, evacuated in the 1950s, produced a number of books in Irish – a best-seller, translated as 20 Years a Growing by Maurice O' Sullivan, and a masterpiece, The Island Man by Thomas O’ Crohan. In the 20th century, some 60 books, mostly in Irish, have been written in the immediate area. 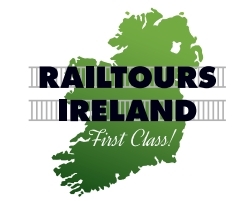 At the end of the day's touring you will be returned to Killarney Station for your return train to Mallow and onwards to Dublin which departs at 5:35 pm. On arrival at Mallow, you will change to the intercity service to Dublin, departing from the adjacent platform.